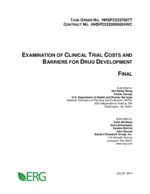 This approach involves encouraging drug sponsors to relax the strict trial enrollment restrictions in the interests of facilitating the patient recruitment process, which, as explained in Section 4.6 above, is a significant barrier to beginning and completing clinical trials. To quantify the impact of this strategy, we used data reported in a 2008 article by Kenneth Getz, which found that “[e]nrollment rates for volunteers who met the rising number of protocol eligibility criteria dropped from 75 percent to 59 percent between the 1999–2002 and 2003–2006 time periods [...]. Patient enrollment cycle times increased for protocols conducted in the latter time period” (Getz K. A., 2008). For the purposes of modeling this approach, we assumed that looser trial enrollment restrictions would result in a return to the higher enrollment rates seen in the period from 1999 to 2002, a 27.1 percent increase from the rates in the more recent period (which would more accurately represent the cost data from Medidata for the 2004 to 2012 period). As enrollment rate is not a parameter in our cost model, we translate this increase in enrollment rates number to a 27.1 percent decrease in recruitment costs per patient. Table 5 summarizes expected cost savings from relaxing trial enrollment restrictions per study. Expected savings across most therapeutic areas and phases is in the order of $0.0 to $0.1 million. In Phases 2 and 3, the savings for pain and anesthesia studies, however, could be as high as $0.2 million and $0.4 million per study representing around 1 percent of study costs, respectively. In Phase 4, largest savings could be realized for respiratory system ($0.5 million) and oncology ($0.4 million) studies.